An excellent alternative to fluorescent tube as a plant lights, but also a great solution for those who want to sustain flowers, trees or other plants in your home all year around. 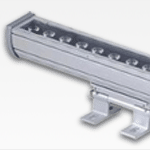 The plant light is easily mounted on the supplied bracket on for example a shelf, on the wall or ceiling. The grow lighting is available in two lengths, so it is best can be adapted to your needs with a smaller rail of 50 cm (18 watts) and a longer rail of 100 cm (36 watts). After assembly, the plant lighting can be rotated 180 degrees in order to adjust the light. If, for example you have plants along a wall, the lamp can be attached directly to the wall and angled down to give the plants the light they need throughout the year. Unlike other manufacturers of LED grow lamps where buzzing and loud fans are widely used, our rails just like our other growing lights use a roubust metal housings for effective and noiseless cooling so that you can use your indoor plant lighting without it being disturbing. These grow lamps are IP65 which means they are approved for outdoor use and therefore can be set up in the garden as well as in the greenhouse to extend the year and provide greater harvest, as well as the grow lights can be mounted as grow lamp indoors for when winter comes and plants needed to be moved inside . Choosing LED grow lights from the Gemma gets you the right wavelengths for your plants. With LED, your plants will thrive with minimal energy consumption. All our grow light wavelengths have been optimized for different plant pigments. Aside from the blue and red light required for chlorophyll production our lamps also have green wavelengths, for two reasons. Green wavelengths mainly promotes the production of tastes and colors (Anthocyanins and flavonoids), at the same time as blue and red light is the basis of white light. Having the green wavelengths in plant lighting is thus of great advantage to growers as this, (unlike other LED plant lights) can help determine all the colors found in plants. Typically LED plant lights use a ratio of 8:1 between red and blue, which gives of a very tough light to look at. For more information on the green wavelengths and colors of Gemma compared to other LED plant lighting, please click on information in the menu. 36 Watt, 100 cm is out of stock. Click here to receive an email when plant lighting is available again.